Seriously, this thing is tiny. Sure, Google's new Home Hub wasn't a secret today -- but I was still surprised at just how tiny the device is in real life. I imagined a tablet-sized screen perched on top of something resembling the giant Google Home Max, but I couldn't have been more wrong if I tried. The Home Hub is positively dainty -- thin, light and unobtrusive. The photo below with my iPhone 8 Plus next to the Home Hub should give you an idea just how small this device is. It still feels like a Google Home product, with the same acoustically transparent fabric found on the Home Mini and Max. But, the display clearly sets it apart from Google's past smart speakers. Not surprisingly, Google made the Home Hub in four colors, all to match this year's crop of Pixel devices. There are the expected "chalk" and "charcoal" options along with the new "sand" pink and an aqua that sadly did not make it to the Pixel phones. The front is, naturally, dominated by the display, while on the back you'll find a mic mute switch and volume up and down buttons. And, as Google was keen to point out, there is no camera on this device, for privacy reasons. While Google hasn't confirmed the Home Hub's screen resolution, I can say it looks very, very sharp when displaying photos. Viewing angles were solid; pictures displayed across the room looked excellent. They weren't too bright or blown out at all. Of course, we're looking at pictures chosen because they'll make this display look great, but it's good to see that it has the potential to look excellent. This is in part due to the ambient light sensor on the front of the display (Google is calling it "Ambient EQ" light sensor) -- it's meant to balance color temperature and brightness in changing light conditions. We'll need to test it more extensively before passing judgement, but the screen definitely looks good at first glance. As for the speaker, it sounds better than you'd expect given its diminutive size. That doesn't mean I'd want to count on it to fill a room with high-quality sound or clearly defined bass, but it sounds good enough as a secondary speaker for playing YouTube or casual music listening in the bedroom or kitchen. It's not as good as the speakers in Amazon's Echo Show, but it does sound better than the Echo Dot. 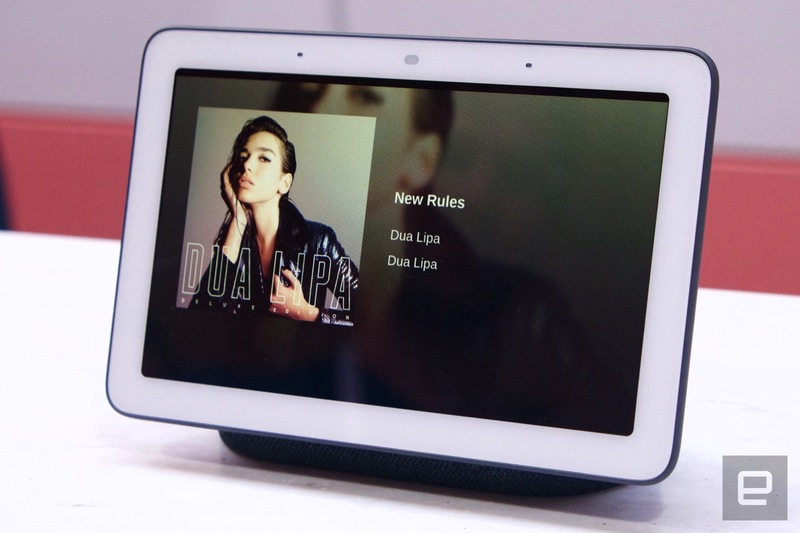 Google's offering the Home Hub with six months of YouTube Premium, which features both ad-free videos and YouTube Music's vast catalog, but it also supports other music services like Spotify and Pandora (just like the existing Home speakers). But beyond YouTube and music services, it doesn't seem like there are any other media options. From a software perspective, the Home Hub isn't running any apps, per se. It can access Google services, of course, and it lets you control thousands of smart home devices. But Google didn't talk about how the many third-party services that work with the Google Assistant would work with the Home Hub (we're going to try and find out more on that front). Presumably, it'll still be able to respond with audio, but there just won't be anything accompanying them on the display yet. At $150, the Home Hub undercuts Amazon's Echo Show, and is only $20 more than the original, screen-less Google Home. We'll need to spend some time with it to be sure, but the Echo Show has already proven that adding a visual component to all the questions we ask smart speakers can be very handy. Based on what Google has shown us so far, it's likely the same will be the case with the Home Hub.